LEGS Equestrian's freestyle designer Katherine Abrams teaches unmounted seminars on the musical freestyle creation process as well as computer skills for editing music. For more information and rates please fill out the form below. 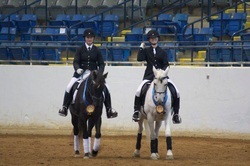 Katherine also teaches mounted clinics in which riders can begin to put a freestyle together and also learn about other forms of musical dressage such as Pas De Deux and Quadrille. Please fill out the form below for more information and rates. Make your freestyle competition ready! LEGS offers online consultations on already completed musical freestyles. Simply submit a video and receive a critique as well as suggestions for improvement on choreography and music editing from a professional designer. Already have a freestyle but want to compete with it at a higher level? Order a level upgrade with a music change to alter both your freestyle's choreography and music editing to accommodate the movements required at the next level! Use this option to upgrade the level of your freestyle within the bounds of the musical editing you already have. This option will take less time and cost than a full upgrade. Indicate the service you would like more information on or would like to order.